Tennessee is known for its sound fiscal management and new investments in the economic ecosystem. The state’s budgetary discipline has allowed it to make investments in public education, workforce development and international business reach. The right-to-work state has no personal income tax on wages or salaries and has the lowest debt per capita in the country, according to the Tax Foundation. No personal income tax on wages and salaries. A long history of fiscal responsibility that crosses party lines. Lowest state debt per capita in the country, per The Tax Foundation. Second lowest in the U.S. for state and local tax taxes paid per capita, per The Tax Foundation. Triple A rate by all major rating services. Successful overhaul of our tort and workers compensation laws. From a quality of life standpoint, the Volunteer State spans three distinct regions, each with its own personality from the mighty Mississippi to the foothills of the Great Smokey Mountains. Tennessee’s music and arts pedigree is undeniable claiming the birthplace of rock ‘n’ roll and country music, the home of the blues and the starting point of soul. Nashville is a must see destination with the Ryman and Grand Ole Opry, and just the word Memphis conjures up the blues and mouth watering barbecue. Tennessee is home to the second busiest cargo airport in the world, the third largest rail center in the U.S. and the nation’s fifth largest inland port. It’s also accessible within a day’s drive to a majority of U.S. markets. There are 6 commercial airports 880 miles of navigable waterways and 95,000 miles of highways. While some states may not have focused as much on their manufacturing workforce in recent years, Tennessee still makes a huge variety of products, including cars, guns, guitars, batteries, refrigerators, savory snacks and whiskey. These products are made in Tennessee and shipped out all over the world. NETWORKS Sullivan Partnership is the economic development organization serving the Northeastern Tennessee communities in Sullivan – including charter partners Bluff City, Bristol, and Kingsport – and Hawkins counties. Northeast Tennessee is home to a skilled, reliable workforce committed to delivering first-rate products and services. Sullivan and Hawkins counties are ACT Certified Work Ready Communities – the first communities in East Tennessee to receive this designation – which provides any company locating or growing in Northeast Tennessee with a significant advantage in terms of a skilled workforce. Northeast State Community College offers custom workforce training at the Regional Center for Advanced Manufacturing (RCAM) with programs for elementary school students through adults. NESCC is the first community college in Tennessee to sponsor registered apprenticeship programs to provide small and mid-sized employers with a structured training process using the U.S. Department of Labor (DOL) Standards of Apprenticeship; the program has around 100 participants so far. The community college broke ground in October on a $29.8 million Technical Education Complex to meet the growing demand for lab space for a wide range of programs related to advanced manufacturing and business technology. There’s no shortage of product either. In October 2018, ground was broken on phase two of Aerospace Park site preparation. (Phase one, a 32 acre Select Tennessee Certified Site, is complete.) Aerospace Park provides direct runway access and will total 105 acres when phase two is complete. The park was funded by Sullivan and Washington counties and the cities of Bristol, Johnson City, and Kingsport, as well as an InvestPrep Grant from TVA and $500,000 Rural Development Grant from TNECD. Bristol Business Park and Partnership Park II are currently increasing their site inventory, as well. 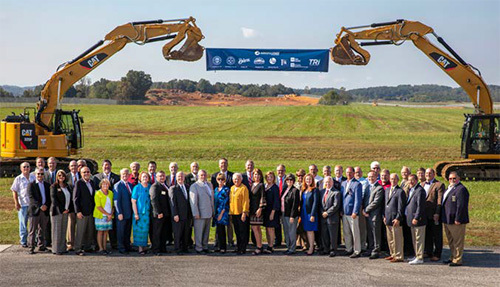 In 2018, Bristol Business Park received a $500,000 Site Development Grant from TNECD, and Partnership Park II received a $1 million Site Development Grant from TNECD.